By Smith's English Clocks Ltd. of Cricklewood, London. Stores reference 6B/221. Approximately 5cm diameter. White metal Dennison case with white dial, subsidiary minutes dial, black hands and Arabic numerals. Engraved with 'A.M., 6B/221' , serial number and 1943 date code to the rear. Keyless winding and running for a period of 8-hours from fully wound. The chronograph action is controlled by the winding knob. 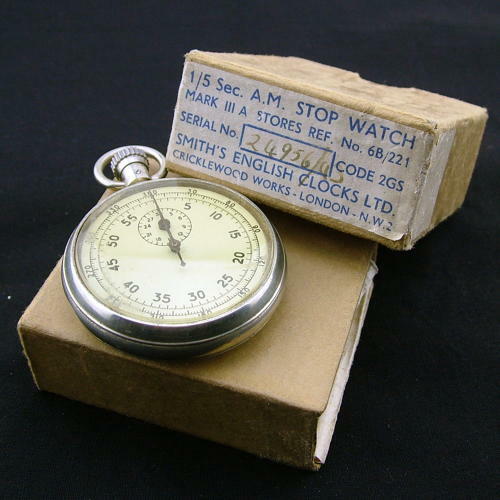 The design and action of this mechanism are such that the second hand should indicate correctly to one-fifth of a second, and that starting and stopping errors should not exceed one-fifth of a second. Intended for general application and aircraft use. The dial is in very good condition. Light marking/scratching on the case. Perspex 'crystal' has scratches. Good working condition. Complete with original issue box with matching serial number/date. Lovely item. Stock code C22085.